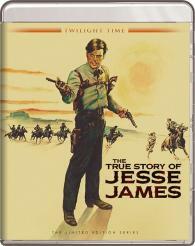 That superb chronicler of youthful disaffection, director Nicholas Ray (Rebel Without a Cause, They Live by Night), brings us the ultimate rebel in The True Story of Jesse James (1957). Robert Wagner stars as the notorious outlaw, Jeffrey Hunter as brother Frank, Hope Lange as wife Zee, and Agnes Moorehead as Mother James. Shot in CinemaScope™ by the one and only Joseph MacDonald (My Darling Clementine).